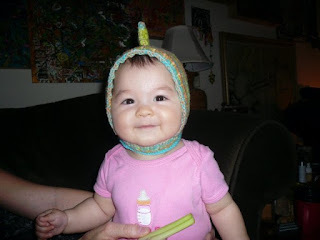 One of my favorite parts about selling yarn on Etsy is seeing what folks create with it. There are times that I look at the finished piece and go WOW and other times......I can't believe that I spun the yarn:) There is one piece in particular that a recent customer (who is fabulous, by the way) shared with me that had my sister and I acting like fools!!! It's one of those things that you see and cry because it's soooooo cute!!!! ......not only is this hat cute but, the baby takes the cake!!! ;) Soooooooooooooooooooooooooooo I'm posting this as a 'Christmas plug' for Amy Lee:) She takes orders for hats.....and boy oh boy are they cute!!!!!! :) Hats for babies and adults in just about any animal that you can think of. You can find her on facebook as Amy Lee or send her a convo on Etsy. Her user name there is Karmabean82 !!!! I Loooooooooooooove etsy for the new awesome fiber fanatic friends that I've been so fortunate to have come across and Shannon, you are one of my absolute fave fiber artists and such a sweet soul~~!! Please feel free to email me with any questions about the hat~! OOOOOHHH those cheeks, so heavenly cute!